William Blake (1757–1827), The Fall of Man (1807), pen and watercolour on thin card, 48.3 x 38.7 cm, Victoria and Albert Museum, London. Image courtesy of and © Victoria and Albert Museum, London. William Blake started painting works showing the Last Judgement, as described in florid detail in the book of Revelation, in about 1805-6. This series of drawings and paintings culminated in a large work in glue tempera which he started in about 1810, and had almost completed at the time of his death in 1827. This article traces these unique images. Blake had a choice of two models which he could use as his basis. The northern Renaissance tradition is more commonly expressed in triptychs which start at the left with the Fall of Man, proceed through a central judgement scene, and end at the right with Hell. Some examples are shown in this article about Bosch’s triptychs. 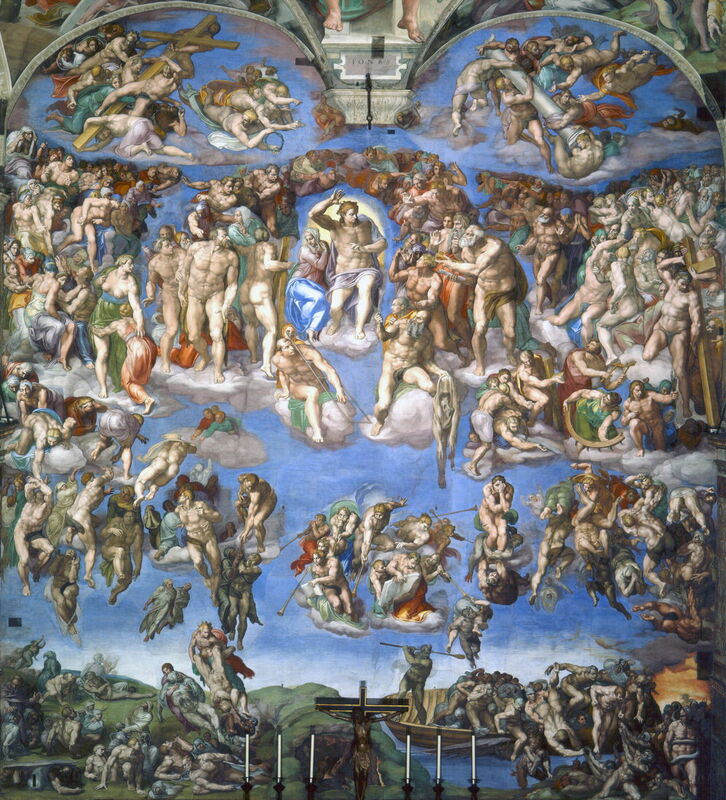 He much preferred the southern Renaissance approach, for which the most famous prototype is Michelangelo’s The Last Judgement (1536-41) in the Sistine Chapel of the Vatican. Although Blake never left Britain, this was readily accessible to him through detailed engravings. Michelangelo di Lodovico Buonarroti Simoni (1475–1564), The Last Judgement (1536-41), fresco, 1,370 × 1,220 cm, Cappella Sistina, The Vatican. Wikimedia Commons. at the top right is the pillar at which Christ was flogged before he was crucified. Thus there is a general trend of ascent on the left, and descent on the right. The Fall of Man (1807) and its companion A Vision of the Last Judgement (1806) (in Pollok House, Glasgow, not shown) were initial compositions tackling these grand motifs. At the centre of the painting, it is not the Archangel Michael who leads Adam and Eve out of the Garden of Eden, but Jesus Christ, while angels bury their weeping faces in their hands. At their feet, symbolic animals interact: a lion seizes a bull, a tiger seizes a horse, and a vulture and an eagle fight over the Lamb. Below them, Hell gapes open, in which an Urizen-like king (perhaps the King of Tyre) awakens Sin and Death. Above the figure of Christ, the serpent is coiled around the Tree of Knowledge. At the top, God the Father is in the sphere of Heaven, with the twelve apostles above him. The sides show general movement downwards, as would be expected in The Fall. This is most unusual, perhaps unique in visual art, in putting Christ in the role which would normally be handed over by God the Father to the Archangel Michael. Bindman argues that this represents the theological tradition of the ‘Fortunate Fall’, in which the Fall of Man is needed for the Redemption of Christ. William Blake (1757–1827), The Day of Judgement, Illustration 12 to Robert Blair’s ‘The Grave’ (1808), watercolour on paper, dimensions and location not known. Wikimedia Commons. 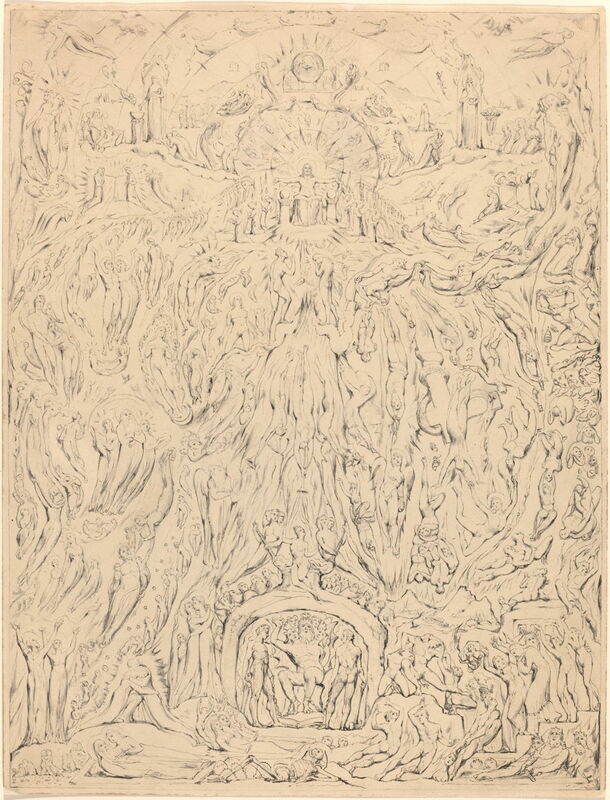 In the recently re-discovered watercolour original of The Day of Judgement, which became Illustration 12 to Robert Blair’s The Grave, Blake follows the layout of Michelangelo’s The Last Judgement more closely. At the lower left, the pious are ascending to Heaven, and at the lower right the sinful descend into Hell. Between them is a group of angel trumpeters who are blowing the Last Trump. In the upper centre, Christ sits on a throne with the open book in which all deeds are recorded, with angel scribes on either side keeping records. Around this heavenly scene are ranks of apostles, saints, and prophets. William Blake (1757–1827), A Vision of the Last Judgement (1808), pen and ink and watercolour on paper, 51 x 39.5 cm, The National Trust, Petworth House, Sussex, England. Wikimedia Commons. 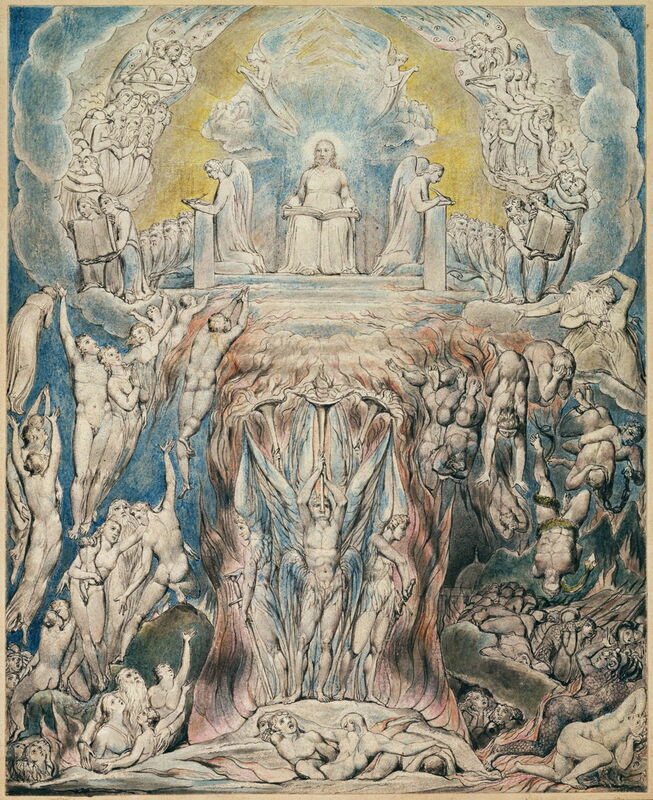 Blake’s next step in elaboration is seen in his A Vision of the Last Judgement (1808), painted as a commission for the Countess of Egremont, and still at her estate at Petworth. The left and right sides retain their upward and downward movement, with angel trumpeters arrayed symmetrically in the middle of the painting. Below them is hell, and above is Christ sitting on his throne, this time with an open scroll across his lap. The number of figures included has risen considerably, as has the overall complexity of the image. Blake gave a textual summary of the painting to Ozias Humphrey, who had recommended the commission. This identifies Adam and Eve as kneeling in contrition before Christ on the Throne of Judgement, with Abraham and Moses below and to the edges. Further to the right, Satan is wound round with a serpent and falling, and further to the right and upwards is Moses, with the tablets of the law at the right edge. Above Christ is the Tabernacle, its veil opened to reveal the cross with two cherubim bowing over it. In front of the curtains there is a seven-branched candlestick and a loaf of Shew bread (unleavened loaves placed each Sabbath in the Jewish Temple, not the bread of Christian communion). At the sides of Christ are a baptism (left), and Holy Communion (right). This has already diverged considerably from Michelangelo’s The Last Judgement. In terms of symbols, its only cross is very small, and there are no others representing the Passion, which for a Christian painting is very unusual, possibly unique to Blake. Unlike most Last Judgements, Blake’s are not about the simple process of elevating the good and punishing the bad, although those processes are shown in the lower side areas. Instead, Blake thinks more of the purging of the wickedness of the whole fallen world. William Blake (1757–1827), The Last Judgement (c 1809), pen and ink with wash over graphite on paper, 45.3 x 34.6 cm, The National Gallery of Art (Rosenwald Collection), Washington, DC. Courtesy of The National Gallery of Art. The Last Judgement (c 1809), in the Rosenwald Collection of the The National Gallery of Art in Washington, DC, is a near-final drawn study, which is hard to decipher, but which probably contains much of the detail of Blake’s finished tempera version. 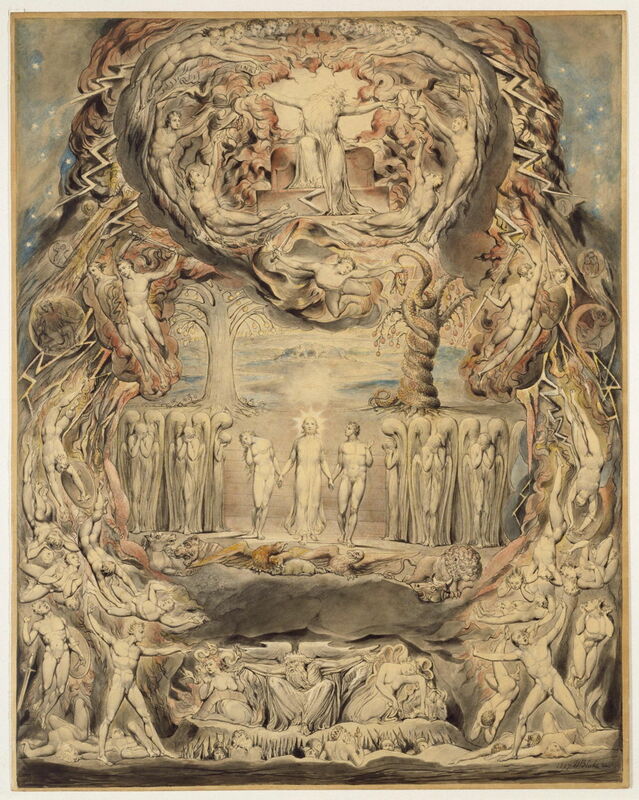 It has a very similar structure and key features to those of A Vision of the Last Judgement above, but is now approaching the claimed total of more than a thousand figures of Blake’s finished work. Tragically, this is the closest that we can see to that tempera painting, which was about 203.5 by 152.5 cm in size, because the final version of The Last Judgement has not been seen since about 1828. Its midline shows, from the top, the table of Shew bread above the cherubim of the Ark of the Tabernacle, Jesus Christ with his arms outstretched, who is surrounded by Jachin and Boaz, the seven eyes of God, and the twenty-four elders sitting in judgement. Adam and Eve are below that, then the four angel trumpeters blowing to the four winds. Over the roof of Hell is sat “the Harlot named Mystery”, beside which is ‘Vegetative Existence’. Presiding over Hell below is the dragon with seven heads and ten horns, whose feet rest on Satan’s book of accusations. On either side are Gog and Magog. Another important figure, seen just to the middle of the lower edge, is that of Albion, here being awakened by Brittannia, and near the upper left corner is a four-headed Zoa. These are clear links to Blake’s personal mythology. One major difference between Blake and Michelangelo is the use of the cross: here, it is seen inverted and falling, to the right of the centre of the drawing, with the Serpent nailed to it, as prophesied in Milton’s Paradise Lost. Blake also omits the pillar which is so prominent at the top of Michelangelo’s fresco, another symbol of the Passion. 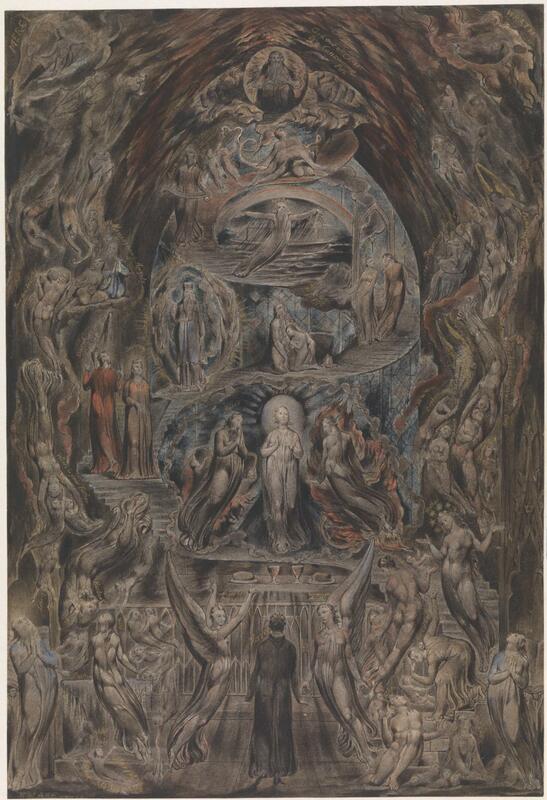 Before his death, Blake did complete another complex painting based on Michelangelo’s The Last Judgement: his Epitome of James Hervey’s ‘Meditations among the Tombs’ (c 1820-25), although it does not itself refer to the Last Judgement. I have already explained its content in this article. 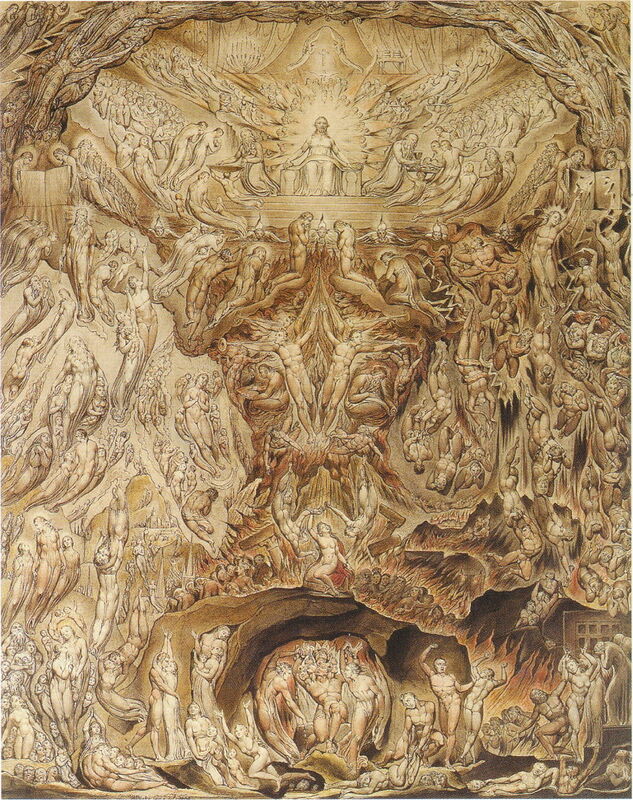 Blake’s series of paintings and drawings of the Last Judgement are some of his most unusual works. Although they follow in the Italian Renaissance tradition, and have common structure, their content is the product of Blake’s imagination. They combine many obscure characters which had become favourites in the mind of Blake, with his unusual religious views, and his personal mythology. As such, they probably tell us more about Blake’s beliefs than any of his other paintings. It is a tragedy that his last and largest painting does not appear to have survived. Posted in General, Painting and tagged Blake, Last Judgement, Michelangelo, myth, painting. Bookmark the permalink.